Historic Home on the West Side of Town with Hot Tub! 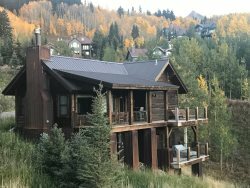 This cute Victorian home is the quintessential Crested Butte house. From the white picket fence to the country kitchen you will truly appreciate in-town 'Butte living like never before! The open living/dining/kitchen area is cozy, yet great for entertaining. Just down the hall is the indoor hot tub! This beautiful jacuzzi tub is in great condition and fits the whole gang with plenty of room... perfect for that post ski or bike soak. Located just one block off Elk, there is no need to use your car once you arrive at the house. Shopping, restaurants and entertainment are all just around the corner. In addition, the free mountain shuttle stop is only two blocks away to take you right up to the slopes! The Maroon Cottage will capture that perfect vacation experience with all the amenities right out the front door! Parking: Off-Street parking along Maroon and 5th St. Very friendly and responsive staff. They were always really friendly and knowledgeable, both before and during our trip. It was fantastic, perfect for our two families traveling together.